We’re seeing an acceleration of M&A activity and a growing IPO pipeline through the end of 2016, but the bar remains high. Accel is an early & growth-stage venture capital firm and is known for its investments in Facebook, Slack, and Dropbox. This is the firm’s annual presentation on what the tech environment is like for founders today and what will happen in 2017, republished with permission. It’s an incredible time to be a technology entrepreneur. A rising “new guard” are officially the most valuable companies in the world: Apple, Alphabet/Google, Microsoft, Amazon, Facebook. But of course, it’s important to stay disciplined. **Bloomberg dug into the numbers here too. Incentivizing Innovative Approaches & Collaboration in A.I. NEW YORK – Something interesting has emerged in voting patterns on both sides of the Atlantic: Young people are voting in ways that are markedly different from their elders. A great divide appears to have opened up, based not so much on income, education, or gender as on the voters’ generation. There are good reasons for this divide. The lives of both old and young, as they are now lived, are different. Their pasts are different, and so are their prospects. The Cold War, for example, was over even before some were born and while others were still children. Words like socialism do not convey the meaning they once did. If socialism means creating a society where shared concerns are not given short shrift – where people care about other people and the environment in which they live – so be it. Yes, there may have been failed experiments under that rubric a quarter- or half-century ago; but today’s experiments bear no resemblance to those of the past. So the failure of those past experiments says nothing about the new ones. Older upper-middle-class Americans and Europeans have had a good life. When they entered the labor force, well-compensated jobs were waiting for them. The question they asked was what they wanted to do, not how long they would have to live with their parents before they got a job that enabled them to move out. That generation expected to have job security, to marry young, to buy a house – perhaps a summer house, too – and finally retire with reasonable security. Overall, they expected to be better off than their parents. While today’s older generation encountered bumps along the way, for the most part, their expectations were met. They may have made more on capital gains on their homes than from working. They almost surely found that strange, but they willingly accepted the gift of our speculative markets, and often gave themselves credit for buying in the right place at the right time. Today, the expectations of young people, wherever they are in the income distribution, are the opposite. They face job insecurity throughout their lives. On average, many college graduates will search for months before they find a job – often only after having taken one or two unpaid internships. And they count themselves lucky, because they know that their poorer counterparts, some of whom did better in school, cannot afford to spend a year or two without income, and do not have the connections to get an internship in the first place. Today’s young university graduates are burdened with debt – the poorer they are, the more they owe. So they do not ask what job they would like; they simply ask what job will enable them to pay their college loans, which often will burden them for 20 years or more. Likewise, buying a home is a distant dream. These struggles mean that young people are not thinking much about retirement. If they did, they would only be frightened by how much they will need to accumulate to live a decent life (beyond bare social security), given the likely persistence of rock-bottom interest rates. In short, today’s young people view the world through the lens of intergenerational fairness. The children of the upper middle class may do well in the end, because they will inherit wealth from their parents. While they may not like this kind of dependence, they dislike even more the alternative: a “fresh start” in which the cards are stacked against their attainment of anything approaching what was once viewed as a basic middle-class lifestyle. These inequities cannot easily be explained away. It isn’t as if these young people didn’t work hard: these hardships affect those who spent long hours studying, excelled in school, and did everything “right.” The sense of social injustice – that the economic game is rigged – is enhanced as they see the bankers who brought on the financial crisis, the cause of the economy’s continuing malaise, walk away with mega-bonuses, with almost no one being held accountable for their wrongdoing. Massive fraud was committed, but somehow, no one actually perpetrated it. Political elites promised that “reforms” would bring unprecedented prosperity. And they did, but only for the top 1%. Everyone else, including the young, got unprecedented insecurity. These three realities – social injustice on an unprecedented scale, massive inequities, and a loss of trust in elites – define our political moment, and rightly so. More of the same is not an answer. That is why the center-left and center-right parties in Europe are losing. America is in a strange position: while the Republican presidential candidates compete on demagoguery, with ill-thought-through proposals that would make matters worse, both of the Democratic candidates are proposing changes which – if they could only get them through Congress – would make a real difference. Were the reforms put forward by Hillary Clinton or Bernie Sanders adopted, the financial system’s ability to prey on those already leading a precarious life would be curbed. And both have proposals for deep reforms that would change how America finances higher education. But more needs to be done to make home ownership possible not just for those with parents who can give them a down payment, and to make retirement security possible, given the vagaries of the stock market and the near-zero-interest world we have entered. Most important, the young will not find a smooth path into the job market unless the economy is performing much better. The “official” unemployment rate in the United States, at 4.9%, masks much higher levels of disguised unemployment, which, at the very least, are holding down wages. But we won’t be able to fix the problem if we don’t recognize it. Our young do. They perceive the absence of intergenerational justice, and they are right to be angry. 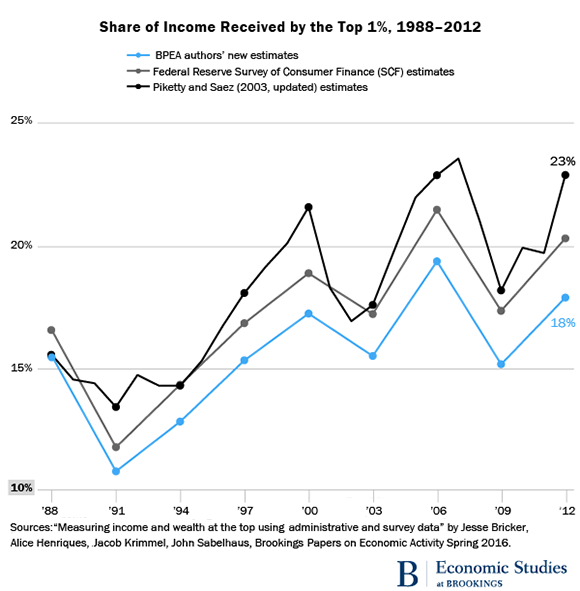 Read new research from the Brookings Papers on Economic Activity. View this email in your browser here. We spent Thursday and Friday of last week sitting at Brookings, discussing six new papers with dozens of the world’s top economists and readying the findings to be published in our economics journal, the Brookings Papers on Economic Activity (BPEA). One of the great things about this twice-yearly conference is that, in the spirit of true academic discussion, it often raises as many questions as it answers. 1. “If this is our technological future, economists aren’t sure it adds up to much.” The Washington Post’s Wonkblog has a great summary of important new research on why we can’t blame the ongoing productivity decline on our inability to measure the benefits of the Internet and other technological innovations. 2. A group of Fed economists challenged what renowned economists Piketty, Saez and others say about the richest 1%. The blue line in the chart below represents the new BPEA estimates. The blue line is still rising—but a lot more slowly. The authors ultimately conclude that wealth and income concentration is rising by about half as much as previously thought. 3. We debated whether federal lending programs served as a “shadow stimulus.” (h/t Wall Street Journal on the apt phrasing.) These programs, especially housing and student loans, grew dramatically during the Great Recession. There was a lively discussion around a finding that the government’s housing and education credit programs were nearly as large as the 2009 stimulus act (ARRA) and on average three times more effective per dollar of cost at stimulating the economy. 4. Boys whose mothers did not complete high school are even more likely to drop out of high school themselves—if they live in areas with high income inequality. Typical explanations, like school quality, don’t account for this finding. The boys’ academic attainment explains part of it, though, reinforcing the view that interventions to get kids on track early may break the link between inequality and low mobility. This interactive map illustrates the point well. 5. American workers are moving around the labor market less and less, and it’s not because of disruptive technologies. This decline is pervasive across losing a job, finding a job, dropping out of the labor force, and moving from one job to another. The “fluidity rate” has been declining for at least three decades, but a closer look at the rate in different U.S. states shows that the decline in fluidity was smaller in states with more workers in routine jobs displaced by technological advancements. See the chart here. 6. If you’ve ever lived through hyperinflation, you know that very poor people are by necessity very sophisticated about inflation and exchange rates. That’s an observation from a conference participant, but it helps explain a finding that the average Argentinian wasn’t fooled by the government’s notorious manipulation of inflation data from 2007- 2013. David Wessel has moreon this “interesting question…[of] how much public perceptions matter.” As the Fed worries about inflation expectations going forward, the lesson from Argentina is that the general public can be very sophisticated when the stakes get high. If you want to know more about BPEA or the new research submitted to this edition of the journal,visit BPEA on the Brookings website. We’ll be back in the fall with more new findings from leading economists.